“We are committed to leading the way in the fight against climate change. In the coming year, we will continue to ramp up our efforts to build a stronger, more resilient global economy,” said Michael R. Bloomberg, founder of Bloomberg LP and Bloomberg Philanthropies. “The more we can accelerate investment in projects that both reduce emissions and create jobs, the more progress we can make reducing health and economic risks.” Read his letter here. In 2018, Bloomberg LP launched two new climate finance initiatives to further complement the company’s work with the FSB Task Force on Climate-related Financial Disclosures (TCFD). The Climate Finance Leadership Initiative (CFLI) and the U.S. Alliance for Sustainable Finance (USASF) are coalitions of influential investors promoting and scaling innovative investment opportunities in the transition to a low-carbon economy. These private sector-led efforts go hand in hand with the work that Mike Bloomberg and Bloomberg Philanthropies are leading to address climate change. “Ten years ago we set out to make our business more sustainable. We looked at opportunities to improve operational efficiencies, financial margins and environmental performance. Fast forward to a decade later, we are on track to meet our ambitious 2020 goals, and we have comprehensively integrated sustainable finance news, data and analytics across our products and services,” said Curtis Ravenel, Global Head of Sustainable Business & Finance at Bloomberg. Bloomberg has pledged to obtain 100% of its electricity from renewable sources by 2025. In 2018, the company received 17% of our energy from renewable sources – up from 11% in 2017. Bloomberg has avoided $116 million in operating costs since 2008. Bloomberg currently obtains energy from six on- and off-site solar and wind projects that have generated more than 38,352 megawatt hours and saved more than $1.7 million. Last year Bloomberg collaborated with four other companies and collectively signed a VPPA to procure a relatively small amount of renewable energy from a North Carolina solar project through this new type of aggregation deal. The project is set to provide energy from 2020 onwards. The company completed four LEED projects bringing the total of environmentally-certified projects to 39 by the end of 2018. One of these four was the first LEED Building Operations and Maintenance (LEED O+M) certification for existing buildings at the global headquarters in New York City. The number of customers using ESG data has more than tripled over the past seven years, to nearly 18,000 users. For the first time, ESG data is available for off-Terminal use via Bloomberg Data License reaching an even wider enterprise audience. Bloomberg released new and updated sustainable finance tools on the Terminal, that help clients assess and disclose carbon emissions, incorporate more environmental data sets in a mapping tool, and analyze green bond markets and a company’s exposure to the Sustainable Development Goals. Bloomberg enhanced its news coverage of sustainable finance and leadership and created a new editorial hub called Good Business, including a weekly newsletter. In 2018, more than 12,000 employees in 88 cities around the world dedicated over 145,000 hours of service to helping those in need, protecting the environment and strengthening our communities. Volunteer hours have almost doubled since 2014. Bloomberg employees responded to natural disasters by raising more than $600,000 for seven disaster relief organizations and assembled more than 40,000 emergency supply kits. In its first year of operations the London Mithraeum Bloomberg SPACE, a museum at Bloomberg’s European headquarters that features a reconstruction of the Roman Temple of Mithras welcomed nearly 130,000 visitors. 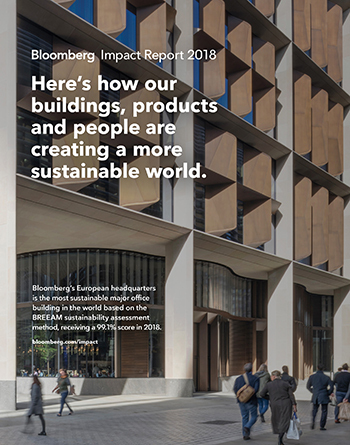 The Bloomberg Impact Report outlines the company’s approach to sustainability and the impact of its products, operations, people and partnerships. The report has been third party verified, and is in accordance with GRI (Global Reporting Initiative) and SASB (Sustainability Accounting Standards Board) frameworks. A downloadable PDF version of the Impact Report, is available at www.bloomberg.com/impact. More in-depth content, including the GRI and SASB frameworks, and other supplemental information can also be found on the website.